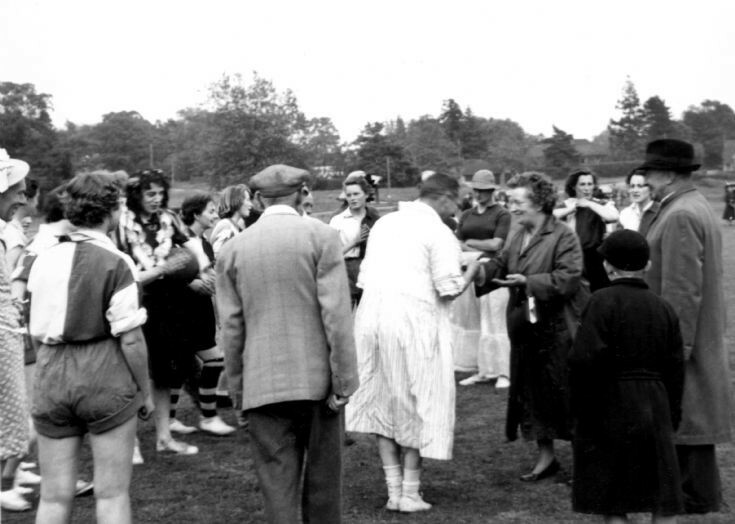 At the Whit Monday Fete in 1957 on Staplefield Common the men of the local cricket team took on the might of the lady stoolball players in a game of football. Team photographs have already been uploaded with the men on picture #1017 and the ladies on picture #899. Those I can recognise are, from the left, Joe Ray (bonnet), Miss Waterson (back to camera in Handcross yellow and black shirts), Vic Newnham (frilly blouse), Gwen Holman (next to Vic), Valerie Elliott (mouth open), Diane Gasson (between two men in foreground), Roger Ray (receiving the runners up prize), June Stenning (née Vigar) (arms raised), Betty Vigar (next to June). Please can anyone add more names or correct those above?